As you may already know from the “About Curio Obscura” page, I am Pandora Wrigglesworth in Second Life but my name in real life is Dov Sherman. 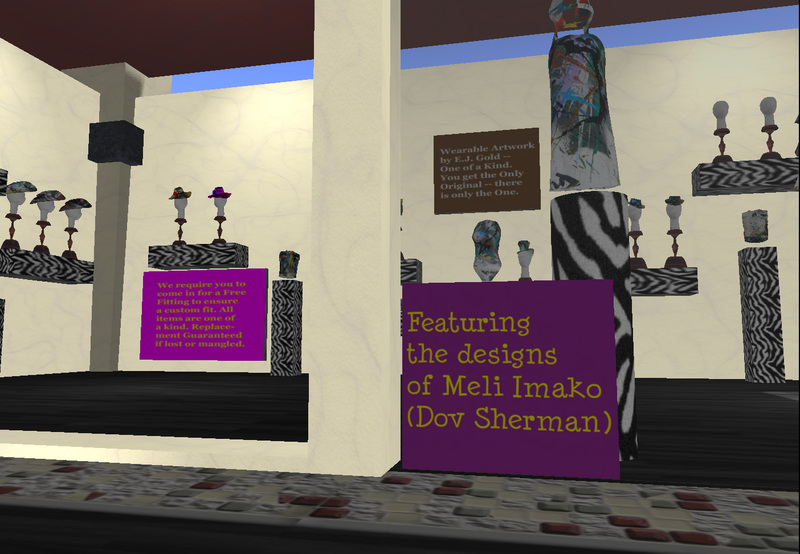 There is a shop in Second Life owned by user leslieannstandup which is claiming to sell products designed by me. They even put a sign in their shop with my name on it. My REAL life name, Dov Sherman. I have never met leslieannstandup. I am not Meli Imako. I have never met Meli Imako. A quick search of Second Life Marketplace shows Meli Imako to be an existing Second Life artist. I don’t know how she is connected to leslieannstandup. But I do know that neither of them are me, Dov Sherman. This isn’t just a question of someone else who happens to have the same real life name as me. I only found out about this because she posted about it on her blog. As you can see, she describes me as “3D animator and game developer Dov Sherman” which sounds like me. More importantly, she also says, “You can visit the website at: curio obscura“ which is definitely THIS very website which you are reading right now. So she is definitely claiming to be working with me and not just someone with the same name. This is a false claim. She also says, “Custom is my middle name, and if I can’t make it, I’ll ask Dov Sherman to craft it up for you.” This is a lie. I do not know this person. If you hire her, expecting work created by me, you are being deceived. The person making this false claim also appears to work under the names Gorebagg and E.J. Gold. I’ve already reported this person to Linden Lab for violating the Terms of Service 6.1.ii regarding impersonation or misrepresentation of affiliation. I have also served this individual with Cease and Desist notices for violations of California and Washington State Right of Publicity law. I personally recommend that you do NOT do business this with person who has falsely claimed her products to be designed in conjunction with me. If you have purchased anything from this person under the belief that you were buying a product made by me, I strongly recommend that you report the sale as fraud to Linden Lab using their in-world Abuse reporting system, located in the “Help” section of the menu. I do not know leslieannstandup. I am not Meli Imako. I do not know Meli Imako. I do not know E.J. Gold. No product currently sold by leslieannstandup AKA Gorebagg AKA E.J. Gold was created by me. Fashionista Runway Mall is not affiliated with me in any way. On a personal note, this situation makes me extremely angry. I have worked very hard to earn my skills and reputation and I strongly resent someone falsely claiming to have me working for them in order to fraudulently cash in on my skills and reputation. The blog post and in-world signage have been removed by a friend of E.J. Gold. This friend expressed the suspicion that the whole thing was just a big misunderstanding. I’m just glad that the whole thing is over now. sorry you are going through this i hope you get it resolved asap! Thanks for your post, and good luck to you. They’ve removed everything citing my name so I have no more direct involvement with him and I’m glad to be done with this guy!